Requeening a hive is great for you as a beekeeper and is good for the beehive too. Beekeepers should not be scared of the process of requeening a hive. With adequate preparation and careful management of the process, both beginner and professional beekeepers can easily and successfully carry out the activity, though beginner beekeepers may seek the assistance of a more experienced beekeeper. This guide will take you through the steps to take when requeening a hive and looks at the factors that influence such an activity. When to Requeen a Hive? Beekeepers have a number of reasons to requeen a hive. The major reasons are the death of a queen, having a poorly egg laying queen or the queen getting old. Queen bees that are more than two years old may not lay eggs in sufficient numbers to keep a beehive going. A queen bee lives for an average of 3-5 years. Over time, she gets weak and her egg laying rate decreases. In the case of death, you will know your queen bee is dead by lack of eggs and larvae. In such a situation where the queen bee is missing, you should urgently requeen your hive. A bee colony without a queen bee will either die, or groom up a new queen from existing larvae. Some beekeepers prefer to requeen their hive on an annual basis, around September every year (the beginning of Fall). It is advised that you requeen a beehive at least once every two years to enjoy the benefits of a thriving beehive. Requeening a hive in September gives you greater benefits in the following spring. However, there is greater risk of queen rejection when you requeen during times of reduced nectar flow as seen in the month of September. Beekeepers often encounter the question of when to requeen a hive. With requeening being strictly on a need to basis, beekeepers have varying reasons to requeen a hive. For most beekeepers, they know when to requeen a hive to resolve disease and brood issues in the hive. These may be diseased brood or missing brood. Colony aggression is another factor that influences requeening. This is in addition to improving the genetics of your hive. 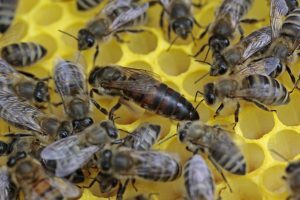 A new queen will introduce her genes into the hive, improving the colony. Aggressive hives may be split during requeening. Simple replacement of a queen with another significantly calms even the most aggressive of bee colonies. Beekeepers may requeen a hive to exert more control over said hive. You may also requeen a hive if the queen has been replaced by one with undesirable characteristics. This often happens where honey bee Africanization is prevalent. Requeening a hive may also be due to the need to split a beehive. This may be due to commercial purposes, or a hive that has too many bees in it. One of the hives you get after splitting an existing hive will require a queen bee. Requeening a bee hive prevents swarming. Honey production is dependent on how strong and vibrant a beehive is. If the bee colony in a hive is not performing well, you may requeen it. Beekeepers cite better honey production as one of the major reasons they requeen their beehives. An often overlooked determinant of when to requeen a hive is drone laying queen bees. With fewer worker bees in the hive, honey production is greatly affected. This is because female worker bees are the ones that carry out the daily activities of the hive that are largely geared towards honey production. There are two ways of requeening a hive: direct and indirect. The direct method of requeening involves releasing a new queen into the beehive. The queen then merges with the colony and lays eggs to keep the colony going. Direct requeening of a hive runs a high risk of the new queen being rejected. The colony will kill the queen bee if they reject her and leave you back where you started – with a queenless beehive. Indirect requeening of beehives is the safer bet. The queen bee is introduced to the bee colony indirectly to allow the colony time to get used to the queen. This article focuses on the indirect method of requeening a hive. It is a comprehensive guide for beekeepers that prefer to requeen their beehive in place of letting the colony groom a new queen. Once you have identified that your beehive is missing a queen, or determined that the existing queen needs to be replaced, you should first purchase a new queen. The queen usually comes in a queen cage with a cork and candy plug. Remove the cork before placing the queen in the beehive. You may also poke a hole through the candy plug. Place the queen cage with the candy plug facing downwards. It prevents the candy from dripping onto the queen bee if it melts. Bees usually eat through the candy plug of a queen cage in two days or so. In this time, the queen bee will be emitting pheromones and is likely to be accepted by the colony. While requeening a hive, place the queen cage in some honey comb without brood. This should be preferably at the center of your bee hive’s brood box so that fresh brood that hatches will largely be familiar with the queen. Avoid opening the beehive less than a week after requeening it. Despite accepting a new queen bee, a colony remains stressed for a number of days. If you open up the hive while the colony is stressed, the intrusion may be blamed on the queen and get her killed. After about 10 days, you may carry out a quick hive inspection looking for signs of queen acceptance. You may spot the queen during the inspection, or see signs of her activity – mainly freshly laid eggs. If your queen is missing, you will have to get another queen and install her. In the hive inspection after installing a new queen, you additionally get the opportunity to free the queen from the cage if she is stuck. If the new queen bee is free of her cage and doing well in the hive, beekeepers may remove the queen cage from the hive. Do not throw away the queen cage once your queen is accepted in the hive. You will use it to move a queen if you need to split a beehive. Once you note the new queen bee has been accepted into the hive, allow her some time to settle in and establish a swarm with her genetics. 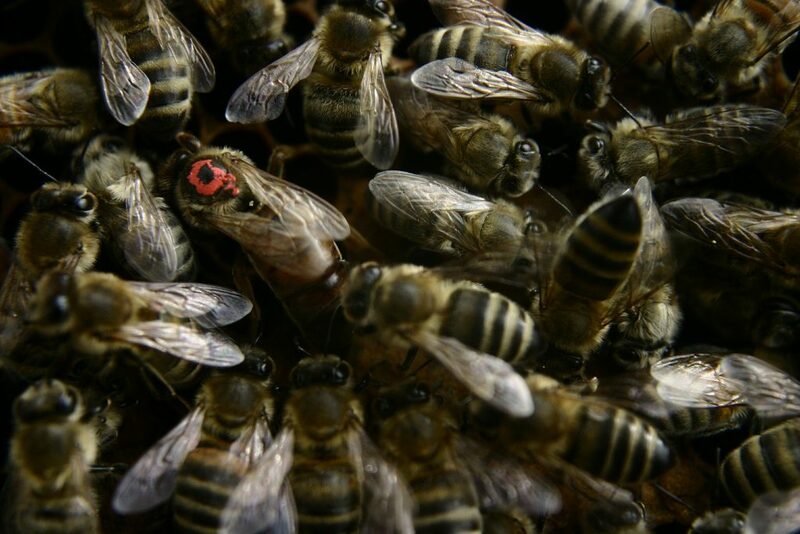 Remaining worker bees often try to overthrow queens and replace them with one with their own genetics. Supercedure cells that you find in subsequent hive inspections must be destroyed to help your queen gain total control of the hive. Over time, the old bees die off and those of her brood take over the hive. Supercedure cells that you note after a queen is old are aimed at replacing her with one of her daughters. Bees do this to ensure continuity of the colony. If you wish to have the queen replaced naturally in the hive, you could let some supercedure cells produce adult queens. Drones in the hive mate with her and the worker bees will take to her naturally. Aggressive colonies are a problem to beekeepers and their neighbors. Requeening an aggressive hive is aimed at calming down the hive. Some hives that are calm may become aggressive over time. This happens when the colony is disturbed often. Beekeepers should take measures to prevent predators and enemies of bees from entering the hive. You must take adequate safety precautions while requeening an aggressive hive. Wear protective clothing and a veil. If you are near human activity, moving the hive with bees inside to another location where they may cause less harm is advised. Beekeepers requeening an aggressive beehive should keep in mind that the queen faces higher chances of rejection. Bad tempered colonies have been noted more likely to reject queens not from their hive brood. They prefer to retain the quality of aggression. Once a new queen is successfully installed into a new hive and takes over, the colony calms considerably. You will note the change within a few weeks. Clubs formed by beekeepers are a great place to meet fellow beekeepers and exchange queen bees. This saves you from having to kill your queen bee. You may also purchase a queen bee and use it to requeen an aggressive hive. While requeening, you may want to use a queen bee whose genetics are established. Such queens can be obtained from established breeders and sellers of queen bees. Plan your aggressive beehive requeening trip well. Beekeepers employ different methods to overcome the aggressiveness of the bees during requeening. You may heavily smoke the entrance of the hive in the morning and move it some feet away. A warm day that makes most flying bees be away from the hive is suited for your requeening process. 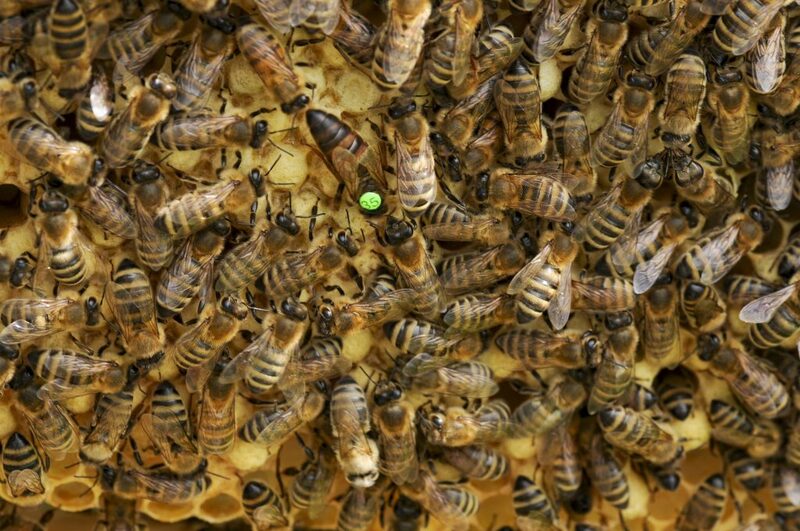 You will need to identify the queen in the hive and remove her. Some beekeepers wait a day or two before bringing in a new queen. This reduces the pheromones of the old queen in the hive. The new queen settles better and releases her own pheromones into the hive. Remove the hive a few feet from its location and replace it with a new hive. Take out the queen from the aggressive hive and move her to the new hive. Leave the two hives in close proximity for a day. Some bees will stick to the hive with the new queen while others remain in the old aggressive hive. The colony in the new hive establishes a new colony. You may then install a new queen into the aggressive hive. The bees in the hive are reduced in number, thus the new queen faces less resistance. Once the queen settles into the hive, she will repopulate it with fresh brood. Beekeeping is an activity that different people take up for varying reasons. Individual beekeepers may have bees for conservation purposes. These beekeepers are in beekeeping for the pollination activity that bees carry out. Other beekeepers add honey and beehive products onto the reasons they are in beekeeping. The strength of a bee colony to carry out hive activities determines how well you achieve your objective as a beekeeper. The strength of a bee colony is assessed through the number of bees in the colony and how active they are. Healthy brood may also be factored in evaluating the strength of a beehive. A weak hive may also be due to predator attacks or a dead queen. Requeening a weak hive should be done only after you have ascertained that the hive is in fact weak. You may ask a professional beekeeper to take a look at your hive and share their opinion with you. Newly installed hives may not accept a queen and require requeening. They may also have a period of adjusting to the hive, so do not be in an excessive rush to requeen the hive. A weak hive gets many benefits from requeening. Once you have settled, requeening the hive as soon as you can. This saves your colony from further weakening and possibly dying off. Once you have requeened a weak hive, you will notice better colony strength after some days. The process of requeening a weak hive follows the procedure of requeening any beehive. You will have to install a new queen into the beehive and remove the old queen bee if she is still present. Even with weak hives, you must wear protective gear and use some smoke on the bees. This will prevent you from getting stung and calms the bees as you are working. Weak hives in an apiary are bothersome to both amateur and professional beekeepers. They take up space and consume resources such as sugar without being equally productive. Beekeepers noting the need to requeen a weak hive should not hesitate to do so. The new queen makes sure the hive thrives and has continuity. Additionally, requeening a weak hive introduces better genetics into the hive. This is usually done using a queen bee purchased from breeders. Beekeepers requeening a broodless hive should keep in mind that bee eggs only remain unhatched for 3 days. Larvae stay uncapped for 8 days. A hive where you see no brood informs you that it has been queenless for 21 or more days. You may see no eggs in your queenless hive during inspection, but note some very small larvae. This means you have caught the problem early and can solve it on time to save your hive. A broodless hive may adapt to the queen not laying eggs or being present in its own natural way. Worker bees sometimes start laying eggs of their own. While requeening a broodless hive, beekeepers are advised to remove such egg laying worker bees. These worker bees may lead rejection of the new queen. They will keep trying to overthrow her. Eggs laid by worker bees may produce more male than female bees. Requeening a broodless hive is involving and must be timed well. As soon as a hive is queenless, the bees prepare larvae from her eggs into becoming a queen once they are adults. You will note these by the presence of supercedure cells. Once the bees have started this process, they ultimately will reject any queen you introduce into the beehive. Virgin queens from an old queen bee’s eggs have a 75% success rate on average. A quarter of them do not succeed on mating and taking over the duties of queen bee in the hive. You may allow the virgin queen bees to mate and then check if they are laying eggs after 2-3 weeks. If you note that the hive still lacks brood, then you may requeen the hive using a foreign queen bee. If you cannot find an old or virgin queen bee in your hive, then you must requeen the broodless hive. Beekeepers place comb with another hive’s eggs in it inside the broodless hive. If the bees in your broodless hive use the comb to build supercedure cells, then you know with certainly that they have no queen bee. Some bee colonies may accept a comb with eggs from another hive. The bees that result from such a comb add the strength of your previously broodless hive. 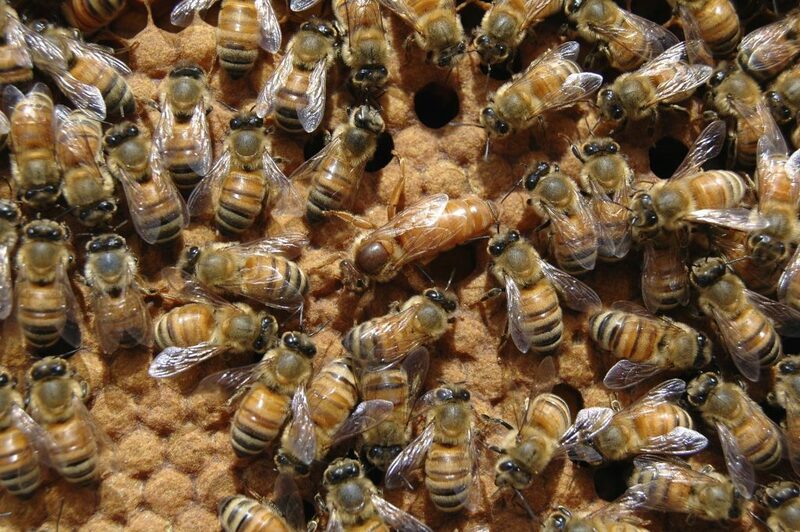 Broodless hives may be caused by an unlaying queen that needs to be replaced, or by diseases and pests. Mites and foul brood disease may leave your hive broodless. In such cases, beekeepers should carry out pest and disease control measures before requeening the hive. As you may already know, the queen bee of a beehive is an adult female bee. She mates with drones from the hive and lays eggs in the hive. A queen bee is usually the mother of all the bees in your hive. Queens are developed from larvae that is selected by worker bees and fed honeybee royal jelly. Special feed makes the bees sexually mature. Queen bees mate only once and then lay fertilized eggs for up to 3 years. Bees follow the queen and will fiercely protect her. Finding a queen is important for beekeepers requeening a hive or carrying out a hive inspection. Queen bees may be marked or left unmarked. An Unmarked Queen Bee and other members of the colony. An unmarked queen bee can be difficult to find from among the thousands of bees in a hive. Beekeepers need to know how to find an unmarked queen with ease for their hive management needs. During hive inspections, it is great if you can spot the queen bee; it is a great assurance that the bee colony is intact and doing well. Finding a queen bee is important for your peace of mind as a beekeeper, and to easily identify when it is time to requeen a hive. Queen bees that have been identified may be marked so you can find them easily the next time. A queen bee is unique in a hive. Experienced beekeepers know how to find an unmarked queen bee based on her appearance. Queen bees have significant differences from other bees in their morphology. They are often the largest bee in the hive and have a pointed abdomen. Beekeepers identifying the queen by sight may confirm finding the queen bee if she is standing with her legs splayed. A queen bee is additionally identified by her barbless stinger. Finding a queen bee is further aided by behavioral characteristics. Piping is an easy way to do this if you have the time to spare. It involves listening for a distinct faint yet rapid sound that has a slight buzz. It is often produced by newly installed queen bees. Two queens politicking for followers in a hive are known to engage in more frequent piping. Finding an established queen by listening to her piping sounds may not be possible. This is because established queens rarely engage in piping. 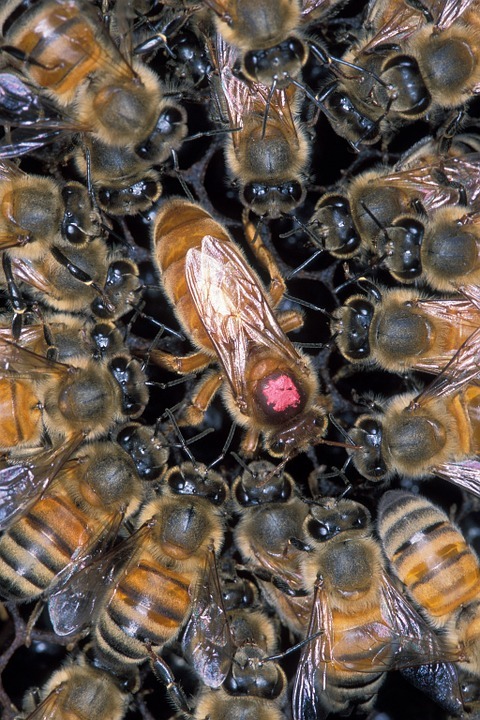 Bees often form a circle around a queen bee. They also generally get out of her way when she approaches. Beekeepers finding an unmarked queen may observe frames for these pointers. You will note bees are denser on some areas of frames and sparse on others. Look for the queen bee in the places where bees are clumping together. White (or gray) for year ending in 1 or 6. Yellow for year ending in 2 or 7. Red for year ending in 3 or 8. Green for year ending in your 4 or 9. Blue for year ending in 5 or 0. A dot of paint on the backside of your queen bee’s thorax is enough as a mark. Since no other bee is marked in the hive, you will always find your queen bee easily. Marking a queen bee is best done in the first hive inspection you carry out in spring. Time your hive inspection and queen marking activity when most bees are out foraging. To mark the queen, you may have to take off your gloves. Do not hold the queen by her abdomen, but by her thorax. Beginner beekeepers may practice marking on some drones before trying it on the queen bee herself. Beekeepers have to periodically remove a queen bee from the hive. Both beginner and experienced beekeepers should be comfortable or familiar with this process. The reasons for doing this vary by beekeeper to beekeeper. Removing a queen bee from the hive leaves the hive at risk of weakening, and the queen may be replaced by the bees in the hive. Beekeepers who have deliberately removed a queen bee from the hive may requeen the hive to ensure its continuity and strength. You should have a plan on how the hive will survive after you remove the queen bee. Do not remove the queen bee from a hive if it is not necessary, or if you are not sure of what you will do next about the queenless hive. To remove a queen bee from the hive, you will need the equipment you would require in a normal hive inspection. These include protective wear, a smoker and a hive tool. Marked queens are easier to find and remove from the hive. If you are not killing the queen bee after removing her from the hive, have a queen cage to hold her for the duration she is not in the hive. The queen cage will be useful in installing the queen in her new hive. Queen bees removed from the beehive may be killed, sold, or used to requeen another hive. In place of killing the queen bee, consider exchanging her with another queen from another beekeeper or hive. Queen bees that are for sale or use in requeening another hive after removal from a hive should be kept caged. They should also be well fed and kept warm. Transfer to another hive should be immediate or at the soonest available opportunity. Do not keep the queen away from a bee hive for more than a day or two. To recap, requeening a hive is something that every beekeeper must go through from time to time. A hive may need requeening for a number of reasons – the queen died or is getting old, hive is aggressive, the hive is too large (in which case a hive split would need to be performed), or honey production is too low. Whatever the reason, beekeepers must know how to quickly identify a queen bee when requeening a hive, so that the process goes smoothly. What are your thoughts on this article? Leave a comment below and let us know. When you login for the first time using a Social Login button, we collect your account public profile information shared by the Social Login provider, based on your privacy settings.We also use your email address to automatically create an account for you on our website. Once your account is created, you'll automatically be logged-in to to your new account on BeeKeepClub. I allow BeeKeepClub to use my email address and send notification about new comments and replies (you can unsubscribe at any time). BeeKeepClub is the ultimate resource guide for beginners to learn about the charming activity of beekeeping. Subscribe to our newsletter mailing list to keep up to date with our latest blog posts, reviews, DIY guides and other offerings. As a bonus, you’ll get 10% off all items in our BeeKeepShop store when you subscribe. © Copyright 2019, BeeKeepClub.com. All Rights Reserved.